October 26, 2017 by Ecommerce News. About Logistics with tags Europe. 7570 views. 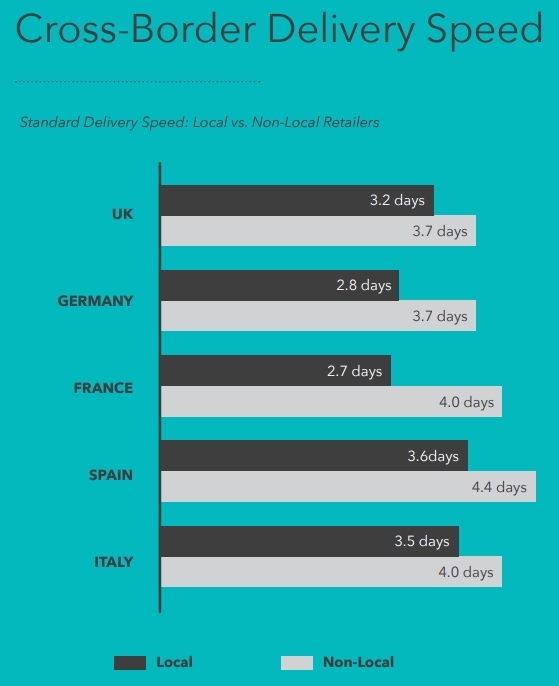 New research has revealed that on average, only half of retailers in Europe offer an express delivery option, while just 6 percent offer same day delivery. It’s the United Kingdom that leads the way in terms of delivery options available to customers. With an average of 4.4 options it’s way ahead of the European average of 2.7 options. This is shown by the annual eDelivery Index report, a survey among 150 leading omni- and multichannel retailers selling in France, Spain, Germany, the UK and Italy. The study is aimed at the delivery and fulfilment performance by retailers and how they compare to customer expectations. The main conclusion from the report is that European retailers fail to meet customer expectations beyond the point of purchase. This is partly shown by the fact that only 52 percent of retailers allow customers to return goods in-store. “The in-store return method offers a significant opportunity to cut down the cost of returns by promoting exchanges and refunds and assimilating in-store returns directly into store inventory”, Radial writes.